Mechical vibration of the author in the low Hertz range produces remarkably wide-ranging, local and systemic, functionally significant results: eliminated severe edema in both legs; increased local fexibility; increased strength system-wide; increased endurance; improved cognition; increased libido; and even improved visual acuity. After four years of treatment, the effects continue, still sustained even without vibrating for a day, and still free of any apparent side effects. The vibration is done by a bed “massager”, $72 from Amazon as shown. 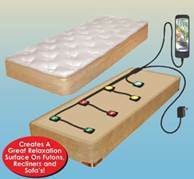 Initially the individual vibration heads were held in close contact (one to three cloth layers) with my legs using Velcro strips, rather than beneath the mattress. Later, I had one set duct-taped to my bed frame, and another set duct-taped to the frame of my wheelchair. In the current arrangement, there are three vibration heads in each sock, wiuh the seventh in my left hand. Based on experience, some of the connections are now strenghened with duct tape. The heads are small, eccentric-mass units, a technology which is simple, reliable, and easily modified for amplitude and frequency in the low Hz range: for example, I have used a much larger version on an 800 ton nuclear component. The most credible explanation I can offer is that the low Hz mechanical vibration may mix the chemicals in the inter-neuron areas, causing a prompt (under one second) increase in the neuron-to-neuron electrical conductivity. Sustained shaking produces a longer term effect (“half life” of perhaps five hours), perhaps caused by increased chemical transport across cell walls. which by chance, is relatively close to the resonant frequency of my brain, which I estimate to be about 7 Hz. In under a second, I had increased cognition and greater visual acuity. The attending osteopath, Dr. Matthew Raymond, of Southington CT, stated that about one quarter of his pump patients report similar experiences. It took me a week to realize this had to be a mechanical effect. I then showed that I could duplicate or amplify the effect with a simple bed massage shaker. That unit transmitted enough power down the legs of the bed and into the floor that I felt the effect even sitting in my wheelchair. That allowed a series of planned and accidental experiments demonstrating immediately beneficial effects for a resident with a nearly immobile leg, a resident with a broken hip, and a resident with significant dementia. Most comparable work has used kilohertz or megahertz electromagnetic stimulation, often introduced using conductors placed deep in the brain. The method here is far quicker, easier, cheaper, and less risky. I believe its effect is similar to that produced by light exercise like walking. Calculation of payback period: Depending on the specific equipment configuration selected and the payback methodology used, payback period is a matter of single-digit days. It is inefficient to calculate how many days: just buy one and try it.